After receiving the bad news and crying for a while and possibly talking to someone supportive on the phone (that’s a good idea), think about food. You initially assume you can’t eat because there’s no food in the house and you’ll sit on the sofa forever and starve. You can’t imagine what you will eat. Then you remember that in the cupboard are a few potatoes that have grown eyes and are starting to try produce more potatoes. They are perfect for your purpose. Rub off the eyes with your thumbs and if they aren’t covered in mud, cut the potatoes into smallish cubes without peeling (the greater your need to eat, the smaller the cubes should be). If they are covered in mud wash them first, or maybe consider eating something else, perhaps from the freezer, as submerging your hands in cold water and scrubbing might become too much to deal with in your current state. Place the cubed potatoes in a snug pan (saucepan or frying pan, it doesn’t matter) with a tablespoon of olive oil and a centimetre of butter cut from a block and a good pinch of salt. Bring the potatoes to frying point and then turn the heat down, and place a lid on top. The pan I was using didn’t have its own lid so I found a similar sized lid to put on top. Really anything will do, the lid doesn’t need to fit perfectly. Check and turn the potatoes in the pan every 5-10 minutes, they might stick a little and all the better, scrape off the crisp bits with a spatula. If you have a taste for it, make a cup of strong tea while they are cooking; I had Yorkshire tea with milk. 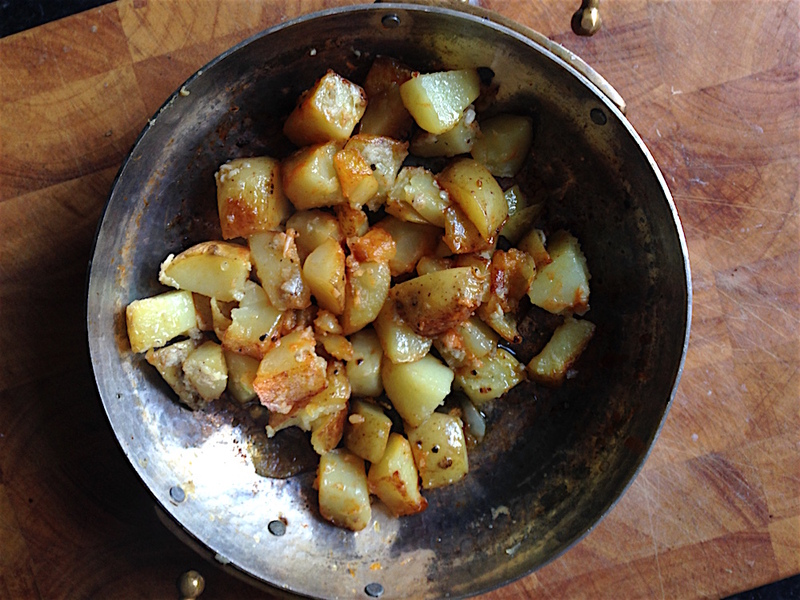 When the potatoes are soft inside and a little crispy (as in the title picture), take the lid off and allow them to continue frying while you crush a clove of garlic with salt, or if you don’t have that, chop up a few spring onion greens. Mix the crushed garlic or onion greens with the potatoes and continue to fry for a minute or two on a low heat until the garlic is aromatic. Stir in a few teaspoons of chilli sauce of your choice. Place potatoes in a bowl, top with grated cheese of any kind and if you wish, a spoon of mayonnaise. Return to the sofa and eat them, covered with a blanket.